These Terms were updated as of 27th September 2018 and apply only to the 2018 series of Strictly Come Dancing. Please note you cannot vote from this page. When the vote opens, head to the Strictly homepage. 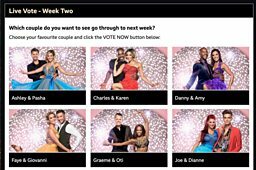 When the vote is open, shimmy over to the Strictly homepage. You’ll find the vote at the top of the page. But remember, the page you're currently reading just provides the instructions - it's not the voting page and you cannot cast your vote from here. Before you can vote, you need to be signed in with your BBC account. If you're a Strictly superfan and voted online last year, then provided you're using the same device, you should still be signed in and ready to vote! If you've never voted online before then you'll need to register for a BBC account in order to vote or, if you already have an account but haven’t visited the BBC in a while, you may need to sign in again before you vote for the first time. Already have a BBC account? You can sign-in directly from the Strictly homepage during the show. Alternatively, you can sign-in any time at bbc.com/signin. You can register from the Strictly homepage during the show, or any time at bbc.com/register. If you sign-in from the vote on the Strictly homepage you’ll be taken to the sign-in page. Once completed, click ‘Continue’ and you will be returned to the vote automatically. Make sure you’re registered, signed-in and ready in plenty of time before the vote opens... or you’ll have Craig to answer to! When the vote is open, it will appear at the top of the Strictly homepage. If you can’t see it, try refreshing the page. The couples will be listed in alphabetical order. You can then select your favourite dancing duo by clicking their name or their picture so that it changes from black to red and a small tick appears to the right of their names. Votes must be cast one at a time and you can change your vote before you submit but once you have submitted your vote it cannot be changed. Once you’ve made your mind up, simply click 'VOTE NOW' and your vote will be submitted. Finding it hard to choose one couple, or maybe you want to vote for your favourite again? You can vote up to three times online each week by clicking the 'VOTE AGAIN' Button. In the Grand Final you will be able to vote a maximum of six times per BBC account. Once you have reached the maximum number of votes the 'VOTE AGAIN' button will disappear and you will not be able to cast any more votes. If you don’t want to vote online you can still vote by phone. The phone numbers will be given out in the show and be made available on the Strictly homepage whilst the vote is open. Telephone Vote: Voters in the UK can choose either to call from their landline using the long (11-digit) number for the couple/s of their choice or from their mobile phones using the short (7-digit) number for the couple/s of their choice. Please note that callers from the Channel Islands and Isle of Man should call from their landlines using the long (11-digit) number to avoid higher mobile charges, as the short (7-digit) numbers are not available in the Channel Islands or the Isle of Man for reasons outside of the BBC’s control. Please do not attempt to vote by calling a 7-digit short number from a landline. The numbers to vote for each couple will be given out during the live shows. Vote lines are opened and closed at the times specified on the programme. Please do not call before the lines open or after the lines have closed as your vote will not be counted. Please be aware voting times may change. Calls to the long (11-digit) number from landlines and mobiles cost 15p plus your network’s access charge. To vote from your mobile in the UK, please call the short (7-digit) number announced for your chosen couple. Calls from mobiles to the short (7-digit) number cost 15p per vote and should cost less than calling the long (11-digit) number from your mobile so please, if you can, dial the short (7-digit) number from your mobile. You cannot text and you cannot dial the short (7-digit) number from a landline. 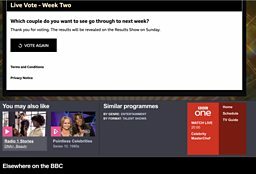 Online Vote: Viewers in the UK (including Channel Islands and Isle of Man) will also be able to vote online by accessing the following link http://www.bbc.co.uk/strictly Viewers who wish to vote online will need to sign in to a BBC account at https://www.bbc.com/signin. If you do not have a BBC account, you can register for one for free at https://www.bbc.com/register. If you have any trouble registering or signing in, you can visit the help pages at https://www.bbc.com/signin/help. The online vote will be open during the same period as the telephone lines. Please check your broadband or mobile contract to check the cost of using data services. The results of the telephone vote and the online vote will be aggregated prior to any announcements. If you are watching Strictly Come Dancing 2018 on BBC iPlayer, following through a website or any other time shift, catch up or on demand service you should not vote since the lines and online vote may have closed. On the shows where the judges’ scores are combined with the public vote, a leader board will be displayed ranking all the couples by total score, highest at the top. These ranks are converted into points, with the highest scoring couple ranked first receiving a number of points equal to the number of couples. For example the couple with the highest combined judges scores when only 6 couples are left competing will receive 6 points, the second placed couple will receive 5 points and so on. When there are couples with the same rank (they all received the same combined scores from the judges) they all receive the same points based on that rank and the next lower scoring couple receive points equivalent to that score minus 1. For example for the 6 couples remaining, there are three joint second place couples. Those 3 couples will receive 5 points. The fifth placed couple will receive 4 points and the couple at the bottom of the leader board will receive 3 points. The Public vote is independently verified once it has closed and the ranking of the couples by public vote is created by points allocated to each couple in the same way as for the judges’ scores. Ties are dealt with in the same way. The points from the judges’ scores and the public vote are added together and a new combined ranking created. In the event of a tie in the combined ranking the number of public votes for each couple will resolve the tie (the couples will be placed in order of the public votes received – highest first). In the very unlikely event that there is a tie in the judges' scores and the public vote, the scores from Head Judge Shirley Ballas will resolve the tie (the couples will be placed in order of the scores received From Shirley – highest first). In the extremely unlikely event of a tie remaining, Shirley will have final decision on breaking the tie. This privacy notice describes how we collect and use personal information about you during and after your relationship with us, in accordance with data protection law. For telephone voting, the personal data is telephone number and voting choice. Harvest Media (UK) Ltd is the BBC’s data processor and is contracted to the BBC to provide the telephony platform. This means Harvest Media (UK) Ltd can only use your personal data within the parameters set by the BBC. Harvest Media (UK) Ltd will collect your personal data in order to provide a robust and reliable vote result to the BBC (this will include counting and capping votes as well as checking for irregularities and, if necessary, for the processing of refunds). Your personal data will not be shared with any additional third parties outside of the BBC, Harvest Media (UK) Ltd and Telescope, UK Ltd without your prior permission, except as required by law. Telephone voters must obtain permission from the bill payer before voting and those under the age of 16 should obtain parent/guardian consent before voting. Make sure you carefully dial only the number of the couple/s you wish to vote for. Votes are only open to individuals as consumers from the UK, and not to any agencies, businesses and/or companies. Please note that if you are directly connected in any way with the production of the programme or the provision of telephony or online voting services to the programme you are not eligible to vote. Please note that you cannot vote by email, red button or text. The BBC reserves the right to disqualify votes if it has reasonable grounds to suspect that fraudulent voting has occurred or if it considers there has been any deliberate attempt to manipulate the result. The BBC can only guarantee that votes individually entered directly through the telephone numbers promoted on the show and those registered through the site http://www.bbc.co.uk/strictly will count. There are a number of contingencies which could occur during or before each show, as with any other live television programme. Contingencies cover withdrawal of any celebrity, professional dancer or judge for health reasons or other unforeseen circumstances or outside the control of the BBC. The remedial actions may include, but not be limited to, changing the format of the show, including, removing, substituting or adding acts and/or judges; and cancelling, suspending or altering voting or one of the voting methods at any time. In the event of any celebrity leaving the competition, the BBC will decide on contingency plans as it deems necessary and appropriate to the circumstances. The BBC, its sub-contractors, subsidiaries and/or agencies cannot accept any responsibility whatsoever for: (i) any technical failure or malfunction or any other problem with any telephone network or line, system, server, provider or otherwise which may result in any vote not being properly registered or recorded; and (ii) any celebrity, dancer or judge leaving the show for any reason. The voting for each show is verified by an independent verification service. Why are Voting Figures for Strictly not published? We invite you to vote for the dancers that you liked best, based on their performance in each show and during the series. Releasing voting figures could affect the way that people vote, and also have an impact on the participants. We therefore do not disclose the exact voting figures. Although the BBC is subject to the Freedom of Information Act, information which is closely connected to our programme-making is not covered by the Act. The Information Commissioner, who regulates the Act, has confirmed that information about public voting is not covered. We are therefore not required to disclose the voting figures under the Act. Who can I contact if I need assistance / have further questions? BBC Helpline: 0370 010 0222 (standard geographic charges from landlines and mobiles will apply). Why can’t I vote outside the UK, the Channel Islands or the Isle of Man? No method of voting offered is available outside of the UK, the Channel Islands and the Isle of Man. Can I vote via social networking? No, you can only vote on the website bbc.co.uk/strictly or by phone. No, all votes will be counted. Does the BBC receive any revenue from the calls? No. The BBC does not receive any revenue. Revenue from the calls (if any) goes to charity. Is the vote being independently verified? In order to cast your vote, you must sign in to your BBC account which you can do here. If you do not already have a BBC account you will need to register before you can vote here. Once you have created a BBC account you are then ready to go. You are advised to sign in to your BBC account before the vote opens. Why is the online vote not displaying properly? If the vote is not displaying correctly on your device then please try refreshing the page or using a different browser or device. If you are using an ad-blocker then this may inhibit your ability to cast your vote. If you disable the blocker and refresh the page then you should be able to cast your vote. Why am I getting a white box where the vote should be displayed? If you have chosen to disable third party cookies in your browser on any device then you may not be able to vote. After you have signed in or registered your BBC account, if you are seeing a white box where the vote should be then you will need to enable third party cookies in your browser on that device or use another browser where you have this already enabled. How many times can I vote online? You can vote online a maximum of 3 times per voting window on Strictly Come Dancing except for the Grand Final. It may appear as if you have been able to cast more than 3 votes however only your first 3 valid votes will have been counted. In the Grand Final you will be able to vote a maximum of six times per BBC account. Can I vote using my smart phone or tablet? You can vote online using your mobile phone, tablet or your home computer. Online votes on different devices using the same BBC account details will count towards the maximum number of votes per account. For Strictly Come Dancing 2018, the maximum number of votes per account will be 3 per voting window except from the Grand Final. In the Grand Final you will be able to vote a maximum of six times per BBC account. Can I vote via the BBC iPlayer app? You cannot vote via the BBC iPlayer app on your Smart TV, tablet or smart phone. Please visit bbc.co.uk/strictly to vote where you may need to sign in again or register to cast a vote. Why is the ‘VOTE NOW’ button not working? If you’re trying to vote but the ‘VOTE NOW’ button has turned grey and you’re having trouble submitting your vote then you might not have correctly selected a vote option. To select your chosen option, click the box or image you want to vote for until the text box changes colour and a tick appears in the right hand corner of the text box. The ‘VOTE NOW’ button should now be available to click and submit your vote. You can change your vote option at any time before you have clicked ‘VOTE NOW’ by just clicking another option until it changes colour and the tick now appears in that box. Once you have submitted your vote you cannot change your vote. Why do I get the ‘Thank you for voting’ message when I vote on another device or browser? The Strictly Come Dancing 2018 vote is capped (see above). If you have already voted the maximum number of times and you go to the vote page on another browser or device and where you are already signed in, or subsequently sign in to your account on the vote page, then you will see the ‘Thank you for voting’ message because you have already cast the maximum number of votes allowed. Why has the ‘VOTE AGAIN’ button disappeared? The Strictly Come Dancing vote is capped and votes must be cast one at a time. After your first vote you will see the ‘VOTE AGAIN’ button which will allow you to cast another vote. You can repeat this process to cast multiple votes one at a time for different couples or the same one. Once you have used the maximum number of votes allowed as stated on the vote, the ‘VOTE AGAIN’ button will disappear and you will not be able to cast any further votes until a new vote opens the following week. Why is the vote not working on my version of Internet Explorer? The default security settings of some Internet Explorer browser versions may prevent the vote from displaying on the page correctly. Please use another browser such as Chrome, Firefox or Safari or a different device and visit bbc.co.uk/strictly to cast your vote when it is open. Why am I stuck in a loop being repeatedly asked to sign in? If you're having trouble signing in to your BBC account and seem to be stuck in a loop when using Safari version 12 (most recent version as of 18/09/18), please try another browser such as Chrome or Firefox or a different device such as your mobile or tablet in order to cast your vote. If you are able, clearing your full history from Safari may also resolve the issue if another browser or device is not available. What if I can't remember the password to my BBC account? If you have a BBC account, but can't remember your password, you'll need to reset it. You can find out how to do that here https://www.bbc.co.uk/usingthebbc/account/how-do-i-change-my-password/. When registering for a BBC account what information do I need to give? This depends on your age. We ask everyone to provide us with your date of birth, gender and a secure password. If you are 18 years or older, we ask for your postcode, and if you are under 18, we ask for your hometown. If you previously used to sign in with a username, you'll need to use your email address from now on if you are over 13. If you previously signed in with Facebook or Google+, we unfortunately do not use these platforms to sign in anymore. If you haven’t signed in to your account in the last year, then it may have been closed unless you have signed in with an email address. If that’s the case, you will need to register for a BBC account again. Why are you asking for my age, postcode/hometown or gender when I register for a BBC account? We use your age, postcode/hometown and gender to give you relevant local info online and in any email newsletters you sign up for. We also use this information to ensure we are making something for everyone, as part of our public service remit. Some parts of the BBC are only meant for certain ages. We also need to know how old you are to make sure you can use the parts that are meant for you. Find out more about how we use your data here. What if I don’t want to register now? If you decide not to proceed with registering your BBC account then unfortunately you will not be able to cast your vote online, however, you can still always vote via phone. Just watch the show for the phone numbers or visit the Strictly website (bbc.co.uk/strictly) whilst the vote is open for the phone vote information. Why when I click on sign in am I not taken to the sign in page? If you click on sign in and you are already signed in to your BBC account then you will be directed to the BBC homepage or you will remain on the same page. That means you are ready to cast your vote once it opens here. I'm having another problem signing into my account that's not covered here - where can I go for help? We have a separate page that can answer your questions around signing in to your BBC account, and also put you in touch with someone if you are unable to find the answer you need. Visit here. I don't have an existing BBC account, and need to register for one so I can vote, but need help. Where can I go? We have a separate page that can answer your questions around registering for a new BBC account, and also put you in touch with someone if you are unable to find the answer you need. Visit here. If you have not used your account in a while and have forgotten your password you will need to click on the 'forgotten password' link before the show to allow enough time for a new password to be sent through. This will only be possible if you provided a valid email address when registering. What exactly is a BBC account? If you have any questions about your BBC account you can find some FAQs here which might help. Why are you asking if I want email updates about more things I’ll love? You can decide if you want to receive occasional emails to tell you about BBC programmes and services or not. It's completely up to you. We may personalise them based on your location and how you use the BBC online site, to help you get the most from the BBC. Find out more about the emails here. You can also unsubscribe at any time. Is there a cost to vote online? No, you will not be charged to vote online by visiting http://www.bbc.co.uk/strictly during the live shows. Please check your broadband or mobile contract to check the cost of using data services. Why have I been charged outside the vote window? We state clearly on screen and verbally when the voting period opens and closes and that callers should wait until that time before casting their vote. There is a small chance that if you called outside this time that another network other than BT would charge for this call. If you have been charged, then notify your service provider immediately. I was trying to call for (x couple) and got (x couple) instead. All voters are asked to dial carefully. The BBC has implemented a thorough testing schedule before each show to ensure correct audio is playing on the correct celebrity line. If you have a phone bill you can send us, we can check whether the number you called corresponds with the correct couple audio. I have been trying to vote, but keep getting the engaged tone. Because the phone lines are very active throughout the UK when the vote window opens, some callers may experience the engaged tone - especially those in rural/remote areas. We recommend that you call back within a couple of minutes when the traffic through your local exchange would have subsided. Engaged tones are controlled at local telephone exchanges and are something that the BBC cannot control. You can also opt to vote online via http://www.bbc.co.uk/strictly. I called but received a dead tone. If after dialling the first four numbers of the premium rate number you heard a dead tone - then this means that you are premium rate barred and you should check with your telephone service provider about lifting the ban if you wish to vote in Strictly Come Dancing. You can also opt to vote online via http://www.bbc.co.uk/strictly. I tried voting, but couldn't get through. Why? Given the high volume of viewers and callers that some TV voting shows generate, it is possible for a very large number of people to pick up the phone simultaneously when the onscreen announcement is made. Sometimes this can cause some callers to get an engaged tone for short periods of time immediately after an onscreen announcement; however, any congestion tends to clear quite quickly. You can also opt to vote online via http://www.bbc.co.uk/strictly. Can one couple's number be constantly engaged and another couple's free? 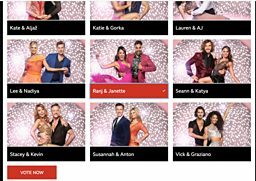 Like all the big shows, Strictly Come Dancing uses a voting system where at least the first eight digits of the phone numbers are the same for all couples, with only the last few digits of the phone number changing depending on who you want to vote for. As the telephone network only uses the first eight digits in a telephone number to route calls to the voting system, it is impossible for calls for different couples to be treated differently. Once calls reach the voting system they are answered in turn, on a first-come, first-served basis. Each answering point is instructed to accept votes for all couples; there are no dedicated answering points for individual couples. This means that your chance of getting through to vote will never depend on the celebrity or couple you wish to vote for. What are Mobile Short Dial Codes (MSDCs)? Mobile Short Dial Codes (MSDCs) are the numbers to call (not text) from UK mobile phones where callers are charged a guaranteed fixed price for the call (15p for Strictly Come Dancing voting) regardless of their UK mobile telephone service provider. The MSDC numbers are shorter than a normal telephone number, typically between 5 and 7 digits long. When MSDCs were introduced calling the premium rate ‘09’ numbers from mobile phones resulted is a large variance in charges, dependent on the UK mobile telephone service provider. MSDCs removed that variance. Calls to the Strictly Come Dancing ‘09’ numbers, whether from a landline or mobile, cost the caller 15p plus the access charge set by the landline or mobile telephone service provider of the caller. Costs to call the ‘09’ numbers vary across both landline and mobile calls. The continued use of MSDCs for voting therefore has the advantage that callers from UK mobile phone networks should pay less to vote as no access charge is applied to these calls. When voting from a UK mobile using a MSDC number you will hear a vote confirmation message in the same way you would when voting by calling a ‘09’ premium rate number from a landline. How do I vote by MSDC? Using your UK mobile phone, simply dial the short number shown on screen for your favourite couple/s, when the vote is open. There is one number allocated to each couple. If you call while the vote is open you will hear a message confirming your vote. If you try to call when the vote is closed you will hear a closed non-chargeable message. You can’t text/SMS to the MSDC. Why are you offering voting via MSDCs instead of Text Voting? Text voting cannot be offered for Strictly Come Dancing due to the relatively short periods in which the vote is open and during which the result needs to be provided and verified. There is the risk of potential delays within the mobile networks at busy times which could result in text votes not being received within the period the vote is open. With a phone call, if the exchange is busy you will hear an engaged tone, however with text/SMS you would not know if there is any late delivery of your vote (causing it to not be registered). There are no such potential network delays with MSDCs other than busy tones at local exchange level with heavy traffic. In addition, call attempts to MSDCs outside of the vote open period, or to numbers no longer in use, are non-chargeable to callers, unlike text where charges may still apply. The advantage of using telephone calls for voting rather than text voting is that the caller knows at the time of the call that their vote has been counted and also that they have been charged for their vote. They will also know from receiving an engaged tone if they did not get through and that they can then just press redial to try again. The same is not true of text voting as the texter has to wait for a confirmation message back from their mobile telephone service provider which may take some time to arrive or which may not arrive at all. How much will it cost to vote by MSDC? Voting on Strictly Come Dancing via a MSDC from UK mobile networks will cost 15p per vote. Will I be charged if I try to vote using a MSDC when the vote is closed? No. Calls outside the vote open period and those made to any of the Strictly Come Dancing numbers not currently in use will not be chargeable. It is very unlikely that callers will be charged when calling a closed vote line as we use free of charge messaging during these times. If you have been charged, then notify your service provider. Why can't I vote by MSDCs from the Channel Islands and Isle of Man? The Channel Islands and Isle of Man are covered by separate mobile telephone service providers who do not currently support voting by MSDCs. Viewers in these regions may still be able to vote by dialling the ‘09’ numbers for Strictly Come Dancing couples from their landlines or mobiles at 15p plus their network’s access charge per vote. Can I call a MSDC from my landline? No. MSDC voting is only available from mobile phones, if you try to call a MSDC from your landline you will not be connected to the voting service and your vote will not be counted. In a very small number of cases, the landline telephone service provider may route the call to a local destination as it may match a “local” telephone number which may result in a ‘wrong number’ call being made. Such calls would be chargeable if they are answered. Can I vote by text message to the MSDCs? No. Strictly Come Dancing voting will be made using telephone call voting only as this offers the caller the benefits of knowing at the time that they place their vote that their vote has been counted and that they have been charged. This would not be true of text votes. Can I still call the ‘09’ numbers from my mobile? Yes. It will cost you 15p plus your mobile network’s access charge per vote. The ‘09’ voting numbers should preferably only be called from your landline if you have one. If using your mobile, you should call the MSDC if you can as it will be cheaper at 15p per vote. No access charge is applicable on the MSDCs. If you decide to call the ‘09’ voting numbers from your UK mobile phone then you will hear a non-chargeable message at the start of the call asking you to call the MSDCs instead. If you remain on the line after the message then you will be able to vote for your chosen couple but your UK mobile telephone service provider will charge 15p plus the network’s access charge per call. Will I receive ‘spam’ / unwanted marketing texts if I vote by MSDC? No, you should not receive any text messages from Strictly Come Dancing or any other organisation as a result of voting using the MSDCs. The BBC does not sell on nor, except if required to do so for legal reasons, supply mobile telephone numbers to any third party. Text spamming is caused by companies sending unsolicited text messages to mobile telephone numbers. The BBC in no way supports this practice and takes great care to guard numbers from any unauthorised use. If you receive unwanted text messages from other companies that you are being charged for, you can contact Phone-paid Services Authority, the premium services regulator on 0300 30 300 20 between 9.30am - 5pm Monday to Friday (excluding Bank Holidays, standard geographic charges from landlines and mobiles will apply) or via http://www.psauthority.org.uk to report this. Why can’t I call the MSDC number from my mobile? There are a small number of UK mobile phone users who are unable to call MSDCs, you should check with your mobile telephone service provider to see if you can lift the calling bar or simply vote by calling the ‘09’ voting numbers using a landline. Why can’t I call the MSDC number from my “Voice over IP” (VOIP) connection? Not all UK telephone service providers, including some VOIP operators, allow voting by traditional premium rate ‘09’ numbers. The new MSDC numbers are intended only for voting via the UK mobile telephone service providers and so will almost certainly not be supported by the fixed line and VoIP telephone service providers. Why can’t I vote by MSDCs from outside the UK? The MSDCs are provided by the UK mobile telephone service providers and are only accessible via these operators. It is also unlikely that calls can be made to MSDCs from UK mobiles when these are outside of the UK, as this would be subject to mobile telephone service providers’ international roaming arrangements with foreign telephone service providers.